If someone offered you a guaranteed 3.5% return for 20 years, you’d probably be tempted either to sign up right away or call the cops to arrest the guy for securities fraud. But the guy offering this deal is Uncle Sam, and you should neither barge in nor run away screaming. You should look closer, because this offer from the U.S. Treasury is legitimate and highly attractive, although it isn’t right for everyone. The government guarantees that if you hold Series EE savings bonds for 20 years, you will get back twice the amount of money you put in. That translates to a return averaging a whisker more than 3.5% annually. A 20-year U.S. Treasury bond, meanwhile, yields about 2.1%. In today’s yield-starved world, a 3.5% return sounds almost like manna from heaven. Is there a catch? Of course there is — several, in fact. First, and worst, that 3.5% return isn’t protected against inflation. And you will earn that rate only if you hold on for the full 20 years; until then, interest accrues only at the current rate of 0.1% annually. So the savings bond is comparable to a zero-coupon bond, which pays no current income but distributes all its accrued interest in a lump sum when it matures. Finally, interest rates could take off between now and 2036, making that 3.5% look a lot less appealing. You can’t use savings bonds for all your fixed-income needs, because they aren’t liquid or inflation-protected. And you can invest only $10,000 in EE savings bonds per Social Security number each year; if you’re married, you and your spouse together can buy $20,000. For wealthy investors, that is chicken feed. 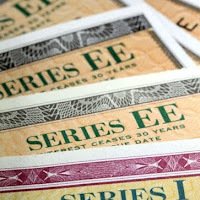 But savings bonds can still make a powerful addition to a portfolio. “I think this is one place where a small investor has a big advantage over the institutions,” says Robert Axelrod, a 42-year-old psychiatrist in Longview, Wash., who has been investing in the bonds for the past three years. To get a 3.5% yield, an institutional investor has to buy bonds that aren’t issued by the U.S. Treasury — and to incur the risk of not getting paid back, the risk of severe loss if interest rates go up, or both. The savings bonds are “roll-your-own annuities,” says Mel Lindauer, a private investor in Daytona Beach Shores, Fla., who moderates Bogleheads.org, a non-profit website that provides investment education and analysis. Better yet, they are annuities that come without any worry that the issuer could go bust or that your heirs won’t inherit the money. And after year five, you can redeem without penalty. David Loeb, a nurse in St. Louis, puts $6,000 annually into EE savings bonds. He knows that will turn into $12,000 two decades later, supplementing his Social Security and the pension he will get from the hospital where he works. An ideal use, says Mr. Lindauer, is to help you to defer taking Social Security. A rule of thumb is that each year you delay retirement and the onset of your Social Security payments will increase your benefits by 8%. If you buy a $10,000 savings bond each year starting at age 42, you assure yourself $20,000 in annual income beginning at age 62. That can help tide you over until you reach 70, when Social Security payments max out. Furthermore, you may use EE savings bonds to pay for higher-education costs, tax-free, if you earn no more than the limits then in force, currently about $92,000 if you’re single and $145,000 if you’re married. Be sure the bond is registered in one or both of the parents’ names, not the child’s name. It can pay for college costs only in the same tax year in which it is redeemed. You can elect to pay tax on the accrued income as you go, but many investors wait until it’s distributed at maturity 20 years after purchase. The income is free of state and local income tax, although it is federally taxable at ordinary income rates.